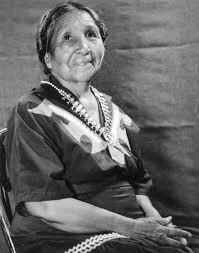 Born in 1878 on the San Carlos Apache Indian Reservation, Viola attended Rice Phoenix Indian School before relocating to the Prescott area around 1900. Through the leadership of Viola and her husband, Sam, the only reservation solely for the Yavapai was established in 1935. Viola became Chieftess of the Prescott Yavapais in 1940, thus making her the first Chieftess in the North American West. Viola formed the Yavapai Tribal Council to better ensure the people's voice in their own governing. Her ability to care for and work with both the Indian and Anglo cultures had a long lasting benefit for her people and for the greater Prescott area. She was a master basket maker using traditional Yavapai symbols representative of mountains, animals, people and celestial images. Viola was inducted into the Arizona Women's Hall of Fame in 1985. She guided her tribe with wisdom and kindness until her death in 1966.